LOS ANGELES, March 1, 2017 /PRNewswire/ -- Starting March 25, Southland communities and businesses are lacing up to support the annual 2017 Walk for Kids, which helps raise awareness and funds for the life-changing services and programs provided to critically ill children and their families by Ronald McDonald House Charities of Southern California (RMHCSC). Now celebrating 40 years of service, Southern California Ronald McDonald Houses keep families together by providing a "home away from home" while their children undergo treatment at nearby hospitals and medical facilities. With a fundraising goal of $2.1 million, RMHCSC dedicates 100 percent of the money raised during the family-friendly 5k (3.1 miles) pledge event towards serving families in and throughout Southern California. Supporters are encouraged to register by starting or joining a team for $25 by visiting www.walkforkids.org. "Over the years, Walk for Kids has become an annual testament to the overwhelming love, support and compassion that exists in our Southern California community for children and families in need," said Vince Bryson, chief executive officer, RMHCSC. "The funds raised from the thousands of supporters who turn out every year provide a lifeline for the families we have the privilege to serve and who make the Ronald McDonald House a home." 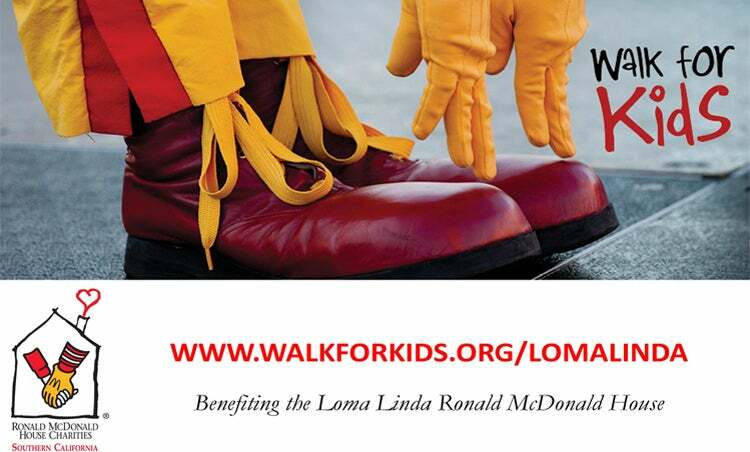 From March 20 to April 7, Southern California McDonald's customers can also support Walk for Kids by visiting a participating McDonald's restaurant and purchasing a "Shoe" for $1. The shoes will then be displayed with the donor's name in a designated area of the restaurant. In 2016, area McDonald's restaurants generated more than $418,000 from shoe sales alone. 100 percent of the proceeds from the shoe sales will directly benefit RMHCSC programs. Additionally, Southern California McDonald's will donate $.25 from each McCafé Shamrock Chocolate beverage purchased to RMHC during the week of March 11-17. The iconic Shamrock Shake has been a key part of fundraising for RMHC since 1974 when the first Ronald McDonald House was opened. Built on the simple idea that nothing else should matter when a family is focused on healing their child – not where they can afford to stay, where they will get their next meal, or where they will lay their head at night to rest – RMHCSC helps families with critically-ill children stay together, connecting them with others facing similar challenges through its six Ronald McDonald Houses in Bakersfield, Inland Empire (Loma Linda), Long Beach, Los Angeles, Orange and Pasadena, and two Ronald McDonald Family Rooms. The Chapter also operates the cost-free, medically supervised Camp Ronald McDonald for Good Times, helping ill children and their siblings rediscover childhood and develop the self-esteem and self-efficacy often lost as a result of the disease. To learn more about Walk for Kids, donate directly or register by starting or joining a team for $25, visit www.walkforkids.org or follow the conversation on social media using #WalkforKids.